At Toby’s daycare tomorrow they’re doing a camp-out, which is less gay than it sounds – it’s like pretending to be boy scouts. OK, less gay than that – get over yourself. So Toby has to take a few things along: a sleeping bag or blanket, a DVD, a book, a snack and a cuddly toy. Emma took the kids along to the supermarket this evening to get something snacky. After unsuccessfully trying to persuade her to buy a 12 pack of huge donuts, they decided that a bag of popcorn would be the thing. Emma was browsing the shelves picking up some groceries, and Toby was bouncing around trying to get her to go to the popcorn aisle. When it was clear to him that she was in no hurry he went off by himself to find it, but came back empty-handed after a couple of minutes (don’t panic, it’s not a huge store) because he was probably a little concerned about getting lost. He bugged her to get moving and hurry up to find the popcorn “Mom, mom let’s get the popcorn, let’s get the popcorn, let’s get the popcorn,” but when she said that he had to wait he marched over to a store assistant and said very politely “Excuse me please, where’s the popcorn?” The man gave directions, and off Toby went – Emma followed this time. They got a big bag of cheesy popcorn, and as they were at the checkout the kindly assistant made sure that they had what they needed. Emma and I are both quite impressed and a shade alarmed at how independent and resourceful our boy is becoming as he’s growing up. At least he’s polite with it though. From almost exactly a year ago: a post on Andrew Sullivan’s blog about Obama. Sullivan is a conservative, but even in the early days of the Obama campaign he was seeing that something fresh and needed was coming. And today, it’s looking like Obama will be able to claim the majority of delegates in the Democratic primary and the word is that Clinton will wind down her campaign and acknowledge him as the presumptive nominee. Either of these candidates would have been history-making as a Presidential candidate for who they are, a woman and an African-American, and they are both super-human in what they have gone through and survived over the past months. I have no idea how they have done it, or how exhausted they must be. Tonight Obama is appearing in the Twin Cities – specifically in the Excel Energy Center in St. Paul, where the Republican party will have their convention in a couple of months – an act of considerable chutzpa seeing as when the schedule was announced late last week the final pieces of the campaign (decisions on the Florida and Michigan pseudo-primaries; the final primaries today in South Dakota and Montana; and today’s flood of super-delegates) hadn’t fallen into place. Unfortunately I’m not able to go, but I would hope that there will be other rallies here. My feeling is that even if you’re not for him, this is quite a moment in history. Just read an article on the BBC about how the Jewish population in the UK is rising rapidly. No comment from me on the point of the article, but some of the way it was written made me want to be picky and pedantic, and seeing as this is my website I think I have the right. First thing I noticed was the picture – it seemed to me that it was quite a cliched-looking group. However the article goes on to talk about how the Orthodox population and tradition is a large part of the reason for Jewish population growth, so kind of fair enough. Could have maybe found a happier looking bunch though! The population fell to a historic low of 275,000 in 2005, but that figure has since increased to 280,000 in 2008. The figures were based on UK census data and the monitoring of Jewish births by academics. Do they mean “The monitoring by academics of Jewish births”? It’s quite a different meaning! 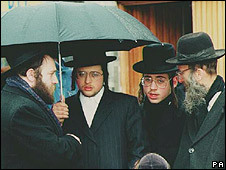 Dr Yaakov Wise, of Manchester University’s Centre for Jewish Studies, says the population has now risen, to about 280,000, and attributes the growth to the extraordinary fertility of strictly orthodox families. Surely they mean that although the strictly orthodox families are large due to, ahem, cultural practices, they’re not necessarily more fertile than non-orthodox Jews, or anyone else. Surely it’s more to do with being less likely to use birth control? Also one of the quotes which came out of this from Dr. Wise: “Approximately half of all the Jewish under-fives in Greater Manchester are ultra-orthodox.” I would think he means that they are from ultra-orthodox families. Can a three-year-old truly have ultra-orthodox beliefs? In fact now I think about it the whole article is kind of grating to me. It seems that this research came from someone who defines Jewishness as subscribing to the Jewish faith, not so much Jewish heritage, based on this quote “Dr Wise – who says his research is based on regular monitoring of Jewish births – attributes the decline in the Jewish population to the fact that about half of more secular Jews marry outside the community, and many of them do not bring their children up as Jewish.” I was under the impression that being Jewish can be as much ancestral (many people describe themselves as being secular Jews) as religious. It was a beautiful early summer day today – quite humid and warm. In a few months we’ll probably be sick of that kind of thing, but today it was just great – lots of greenery, and the humidity in the air really carried the aroma of tree and lilac blossom. Around 5pm we were just getting ready to go over to our neighbors’ place for dinner, when I looked out of the window and noticed how dark it was getting. And windy too. In fact after a moment I saw that the rapidly gathering clouds were moving in a strange way, with tiers of the clouds moving in opposite directions. This is not generally a good sign, as it means that the wind is unstable and can even indicate spinning air – tornadoes. Fortunately we only had a few spots of rain and distant rumbles of thunder, but some really strong gusts of wind. When I stopped looking at the sky I noticed a huge tent-like structure had blown out of the backyard of the house across from us, and onto the road, blocking cars. The owners of that house have this tent in their yard to protect some equipment they have stored there, and even though it seemed to be moored in place, clearly the gust was too strong for it to hold. I zoomed out to let the owners know what had happened, when I saw a guy wrestling with the thing, and thought I should probably help – it’s about the size of a two car garage and made of metal poles with big sheets of tarpaulin. We managed to get it out of the road and into the alleyway, when one of the guys in the house ran out clearly agitated at what had happened. We dismantled the thing and thought that was it. Emma, Toby, Dara and I went to our other neighbors as planned, and had a great evening with good food, drink and friendship. We did notice that the temperature dropped about 20 degrees in half an hour or so, but the weather stayed really calm. Looking at the news this evening it seems that we actually got off lucky – just north of the Twin Cities in the town of Hugo there was a big tornado which killed one person, seriously hurt eight others and damaged more than one hundred homes. Here’s a photo gallery – crazy stuff. Just posted up a new batch of pictures – hope you like them. We had a baby photo competition at work a couple of weeks ago, where we were asked to bring in baby/child pictures of ourselves. There were two categories – age 0-4 and 5-8, and prizes were awarded for the easiest and hardest to guess, and also for the cutest in each category. And so it came about that to my surprise I won for the cutest 0-4 picture. 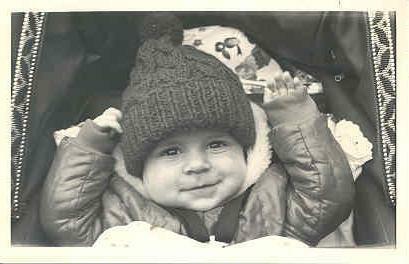 Very flattering, except perhaps for the thought that I peaked at around 8 months. Oh well.